Building on the company's more than 35 years of involvement in advanced electric vehicle development, Mitsubishi Motors has unveiled its first all-electric production vehicle bound for the North American market. Based on the very popular gasoline-powered "i" minicar in the Japanese market, this roomy and practical four-door 2012 model serves as the basis for the new 100% battery-powered Mitsubishi "i" for the North American market. The zero tailpipe emission "i" will be the first North American production vehicle to be powered by Mitsubishi innovative Electric Vehicle (MiEV) technology – cutting edge drivetrain engineering that will serve as the basis for future ultra-environmentally-friendly vehicles from the company. Gone are conventional automotive systems including a gasoline engine, transmission and a fuel tank, having been replaced by advanced components including a lithium-ion battery system, electric motor and an efficient battery charging system in the all-new "i". 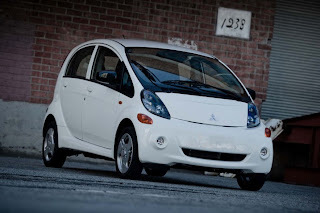 This electric vehicle has already proved itself a viable and reliable form of transportation as Mitsubishi has been selling the car in its home market since the summer of 2009; production has already commenced for the European-spec i-MiEV, with deliveries beginning later this year. Mitsubishi anticipates an initial roll out of the "i" to its dealership network in the western United States (specifically California, Oregon, Washington and Hawaii) in November 2011, with entry into the northeastern market to follow by March 2012 and nationwide availability by the end of 2012. The vehicle's MSRP is expected to be around $30,000, not including Federal and available state financial incentives. The new production Mitsubishi "i" bound for the North American market further differentiates itself from its Japanese- and European-spec versions with a retooled, larger body to provide even more interior comfort for four adults, along with new North American-spec bumpers front and rear for enhanced protection in the event of a collision. Other noteworthy safety measures on the North American-spec vehicle include airbags that protect passengers and control deployment force, Active Stability Control (ASC) and a Tire Pressure Monitoring System (TPMS) - all included as standard equipment. Thanks to its extremely efficient all-electric powertrain, the Mitsubishi "i" produces zero on-road CO2, making it a zero emissions vehicle. What's more, when factoring in the CO2 emissions produced by the power plants that generated the electricity that provides the energy for the "i", this revolutionary Mitsubishi production car only produces about 30% of the CO2 emitted by the 660cc gasoline engine that powers the non-electric-version of the car in its home market. And the reduction in CO2 becomes even more statistically significant considering that the 660cc gasoline engine found in the Japanese market is only about one-third of the displacement of the typical four-cylinder gasoline engine powering cars in the North American market. Additional energy efficiency can be wrung from the "i" model's electric powertrain thanks to Eco (Economy) and Brake driving modes that supplement the vehicle's standard Drive mode. The Eco mode limits excessive power usage from reaching the motor while the Brake mode increases the resistance of the regenerative braking system (especially when driving downhill) to feed even more energy back into the car's bank of lithium-ion batteries. The operating cost per mile of the electrical-powered Mitsubishi "i" is significantly cheaper than that of a comparable gasoline-powered vehicle. In Japan, the operating cost is only 1/3 that of the 660cc gasoline engine-powered version of the car, and the operating cost can drop even more significantly than that of its internal-combustion sibling by taking advantage of reduced electricity rates by recharging during nighttime or off-peak hours*. Thanks to the vehicle's excellent packaging and engineering in relation to its size, this uniquely styled automobile provides an excellent level of safety, ample room for four adults plus handy cargo space. How can a small car possess such ample interior volume? Mitsubishi engineers have cleverly placed the high-capacity lithium-ion batteries beneath the floor, and the electric motor, inverter and battery charger have been located behind and below the rear passenger area. This setup also has the added benefit of lowering the vehicle's center of gravity. Along with the wheels being placed at the farthest corners of the vehicle, this gives the "i" exceptional stability along with surprisingly agile handling. The power system consists of a permanent magnet synchronous electric motor and a high energy density lithium-ion battery pack that consists of 88 cells (22 modules, 4 battery cells per module) for a maximum battery capacity of 16 kWh. The battery modules can be installed either transversely or vertically; this packaging flexibility allows them to be stored underneath the cabin floor. All 88 cells reside within an extremely sturdy stainless steel capsule to provide maximum protection. The "i" also features a groundbreaking three-way battery charging system that allows the vehicle to be charged using the onboard household charger through either 110V (15A) or 220V (15A) power sources or by a quick-charger system that utilizes a three-phase 220V power supply. The charging times from a very low battery to completely full are approximately 8 hours at 220V and 16 hours at 110V. The three-phase 220V quick-charger can take a low battery all the way up to an 80% battery charge in under a remarkably fast 30 minutes. The three-phase quick-charger makes use of a special outlet that is accessible on the driver's side of the vehicle, while the onboard household charger's outlet is located on the passenger side of the "i". The Mitsubishi "i" has undergone several years of exhaust testing and evaluation not only internally by the Japanese auto manufacturer but with several other institutions, including seven utility companies in Japan, as well as prototype evaluation programs with major United States utilities Southern California Edison, Pacific Gas and Electric Company (PG&E), Portland General Electric and the Tennessee Valley Authority. And in an effort to help expand and improve the logistical side of the electric vehicle ownership experience, Mitsubishi has teamed with corporate titans including consumer electronics retailer Best Buy and leading power management company Eaton Corporation. Best Buy, through its 20,000-plus strong employees in its Geek Squad division, has partnered to provide site analysis and work to manage installation of a Level 2 Charging Station it will sell through its stores for Mitsubishi "i" owners to use in their own homes. Designed and manufactured by Eaton - a company that has more than 20 years of experience in developing electrical and hybrid power systems for commercial vehicles - this 220V charging station will cut the time it takes to charge the car's batteries in half when compared to a standard 110V electrical outlet. *Note: Electricity rates can vary by region, supplier and timing.